New technology will be rolled out next year enabling them to do person and vehicle searches and get alerts about suspected offenders in their area. A COMMITMENT BY An Garda Síochána to modernise the force will soon see gardaí on the beat issued with mobile devices that will allow them to access information on criminals. Garda Commissioner Nóirín O’Sullivan today launched the organisation’s Modernisation and Renewal Programme, which commits to making the prevention of crime its “number of priority” and to putting victims at the heart of the service. O’Sullivan today told reporters that she wanted to see An Garda Síochána become a “beacon of 21st century policing” that other police organisations across the world would look up to. Part of this five year plan involves the rolling-out of €200 million worth of new technology, including the “going mobile” approach. Aeneas Leane head of IT at An Garda Síochána told TheJournal.ie that gardaí on the beat will be issued with a device, either a smartphone or tablet, which will allow them to access information systems in realtime. “At the moment we’re very much tied to a garda station in terms of accessing Pulse and our HR systems,” he explained. They won’t have to search for it so they can be watching out for any individuals that we have an interest in. So it’s not just about enquiring, but also about pushing out relevant information to the operational member on the ground. 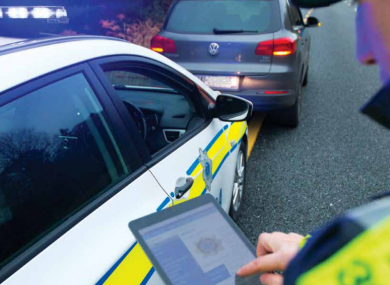 His team has already been working on an app that would allow gardaí to do person and vehicle enquiries and it is hoped that a “substantial part” of the system will be rolled out early next year. Gardaí will also be able to update information on the system and file reports so they no longer have to spend so much time at the end of their shift filling in paper forms. Security is an obvious concern with this new system and Leane said encryption is “a key aspect” as well as a strong central system which will monitor the devices. Another initiative will free up gardaí who are currently sitting in CCTV control rooms monitoring the footage. “We have a technical layer that will hopefully remove the guard from most of the physical monitoring of it,” Leane said. “We will have profiles attached to individuals and if there are any warnings attached to particular people the facial recognition system can kick in there and bring up an alert”. More vehicles will also be equipped with Automatic Number Plate Recognition (ANPR) technology, and have the capability to receive and transmit data over 3G so they can quickly track criminals who are using the road network and road traffic offenders. Email “Gardaí on the beat will soon be able to access Pulse data on smartphones ”. Feedback on “Gardaí on the beat will soon be able to access Pulse data on smartphones ”.